To win a screen role, an actor must learn to contend with an on-camera audition. Understanding how to make the crucial adjustments to one's craft that this kind of audition requires is vital to the career of any screen actor. Auditioning On Camera sets out the key elements of a successful on-camera audition and explains how to put them into practice. 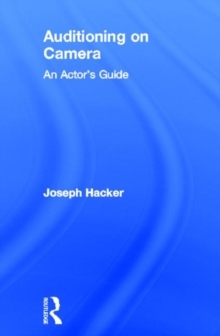 Joseph Hacker draws on 35 years of acting experience to guide the reader through the screen auditioning process with an engaging and undaunting approach. Key elements examined include: textual analysisknowing where to lookdealing with nerveson-camera interviewsusing the environmentretaining the camera's focusThe book also features point-by-point chapter summaries, as well as a glossary of acting and technical terms, and is a comprehensive and enlightening resource for screen actors of all levels.